This post was originally done in September 2010 and is being republished as part of the Blast from the Past series. Isn’t she just too cute? She’s one of a series of needlepoint mini-socks based on quilt designs I did in 2001 for a friend’s children. Recently I was asked about her and so I wanted to share the directions with you. Sunbonnet Sue is no spring chicken. This applique quilt pattern has been around since the 1930’s, showing her cheerful profile on all kinds of quilts doing all kinds of activities. I have seen her hanging laundry, gardening, shopping and chatting with friends. This mini-sock used the basic Sunbonnet Sue design with a textured background. Sue always wears a bonnet and an apron which provide the stitcher with some nice opportunities to show off stitches. In this design her apron is done in a Tent Stitch version of gingham and her bonnet is done in Dotted Swiss stitch which looks like a polka dot fabric. 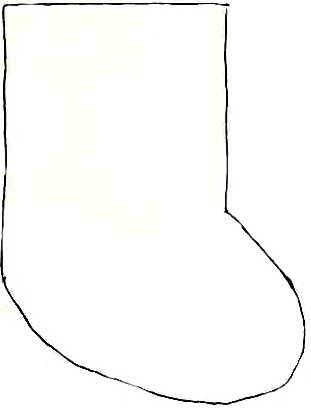 Begin by tracing the outline of the stocking onto your canvas from the linked image. 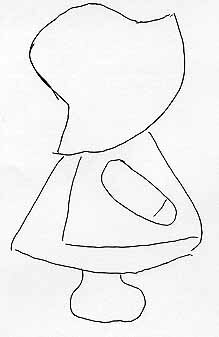 Center the linked drawing of Sunbonnet Sue under the canvas and trace it onto the canvas. Use a non-xylene permanent marker like ZIG Fabric markers, SCA-UF markers or FabricMate Fabric markers. Use four strands of floss throughout for stitching. Start by stitching her hand using four strands of floss and Basketweave. Now stitch her boot with four strands of the black floss. Next stitch her apron using the medium, light values of color family A and white. This is a tent stitch pattern which mimics real woven gingham. It is easiest to stitch all the stitches in the light color first. These will be every other stitch in each row, forming a checkerboard pattern. Now fill in with white skipping every other row. Once you have stitched the white, then fill in the remaining stitches with the medium floss. Move on to stitching the dress and sleeve. These are stitched using Nobuko is the darkest shade of color family A. Once you have finished stitching her dress, move onto the bonnet. The main color of the bonnet will be your accent color. Stitch this in Basketweave but skip every other stitch in every fourth row. Once you have completed the main color of the bonnet, fill in the skipped stitches with cross stitches done in white. This stitch is called Dotted Swiss. The background is done in a simple criss-cross pattern with horizontal and vertical stitches going over two threads, called Woven Plait. I find this easiest to stitch in horizontal or vertical rows, switching the direction of each stitch. It can also be stitched in diagonal rows. All work just fine, but pick one direction and stitch the entire background this way. I’m going to be looking for more of these projects and will be featuring them from time to time. Yes, there is a boy, Overall Bill. I’ll look for him and post him when I can. Abosultely adorable!!! When I put on my reading glasses I was thrilled with the details. I can’t wait to get started. I’ll keep you posted. Thanks for sharing Sunbonet Sue!! !